Vaseline is a product which has been out for years, it has become the generic name for Petroleum Jelly which is a translucent jelly consisting of a mixture of hydrocarbons, used as lubricant or an ointment. When I was younger, I always thought Vaseline was used just for chapped lips but as I've grown and learned more about beauty, I have learnt that Vaseline is great for a variety of different things. 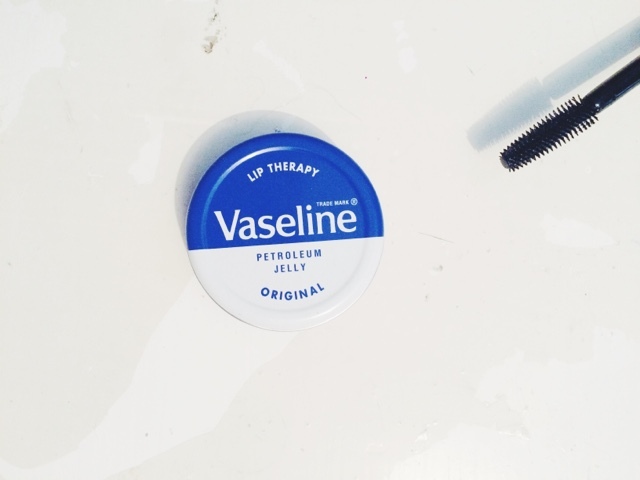 I'm going to share with you some beauty tips using Vaseline which I have been doing for years. Sounds strange but it works wonders. Applying Vaseline to your eyelashes helps condition and moisturize your eyelashes making them stronger and less likely to shed. It also helps with the growth of your eyelashes, it helps speed up the growth process and also makes the new eyelashes that are growing in much more thicker and longer. I like to apply Vaseline to my eyelashes using a clean mascara wand every night before I go to bed and I have seen a massive difference in them, they are stronger and healthier plus there not as dry as they used to be. 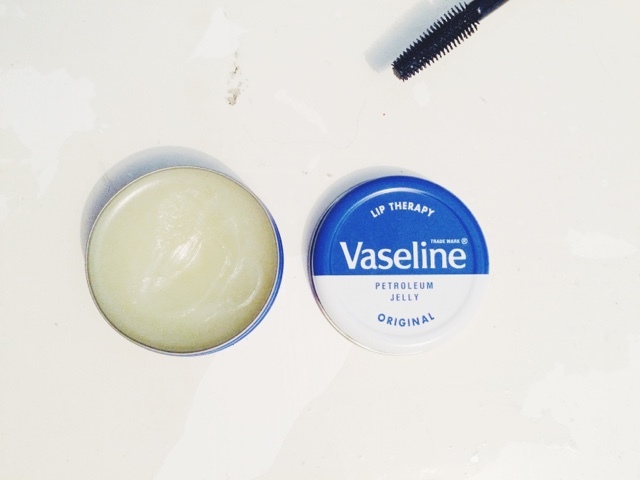 I think this is the most obvious tip and what people use Vaseline for the most. If you have really chapped lips like I do, especially in the colder months, then Vaseline is the solution for that. Just apply a fair amount onto your lips and once it has sunk in, you will have smooth kissable lips. If you're going out for the night and you want your perfume to last throughout the whole evening even after all the dancing then apply a thin layer of Vaseline on your neck and wrists before you spray your perfume. Once you've sprayed it, the Vaseline will help the scent stay on for much longer. What most people don't know is that Vaseline is an excellent moisturizer for people with dry skin. Using this on cracked elbows or even any dry patches that you have on your skin and it will work wonders. Vaseline is amazing for getting rid of any unwanted makeup. Whenever I muck up my makeup, I always getting a bit of Vaseline on a cotton bud and simply wipe it away. It comes straight off. You could also use this as a cleanser at night time to take off all your face makeup then just wash it off with some warm water, not only does it take off makeup but it also helps to keep your skin soft. Apply a very thin layer of Vaseline to your eyelids and let it completely soak in before you start putting eyeshadow on. This works as a great eye primer and it helps your eye makeup stay on throughout the day/night. You HAVE to make sure it has completely sunk in before you apply eyeshadows though otherwise it'll just slide off. If you have recently gotten a new tattoo then apply Vaseline to it once a day to help keep the moisture in and to help it heal a bit faster. Vaseline is very good at moisturizing skin and tattoos have a tendency to scab however if you apply Vaseline it'll help it scab less and heal quickly. This trick is mainly used by celebrities or beauty contestants. Applying a thin layer of this onto the front of your teeth will help stop lipstick from getting onto it. This trick is perfect is you're going on a night out and you're wearing a bold coloured lipstick. If you're someone who likes to dye their hair a lot (me included) you will know how much of a pain it can be when you get dye all over the sides of your face and the back of your neck. Before dying your hair, make sure to apply a layer of Vaseline around your hairline and neck to assure that you don't get any staining. This tip is leaning more towards to the people that suffer with dry skin. Adding a bit of sea salt to Vaseline acts as a great exfoliator for your body. I like to keep some Vaseline mixed with sea salt in a mason jar in the bathroom so that I can exfoliate my body every time I take a shower or bath, it leaves my body feeling amazing. 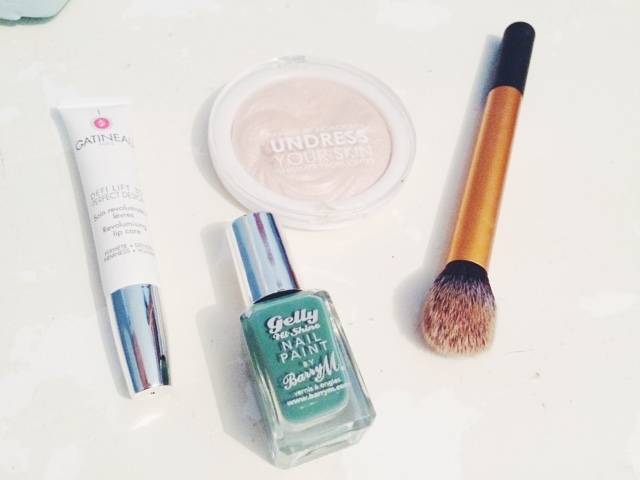 There have been a few products that I have been reaching to a lot more than others recently. Each product mentioned has been well and truly loved by me these past couple of weeks and I'm excited to share them with you all. I couldn't find this Barry M colour on the Boots website but I know that they sell this shade in store as I only bought it last week. Some of you may or may not know that Barry M have brought out there A/W 2014 collection of nail polishes. They come in 6 different shades but the 'Cardamom' shade stood out to me the most. I have been wearing this nail colour every single day since I bought it. It's a gorgeous dark frosty green colour which is perfect for Autumn. The formula of this nail polish is so smooth and it glides on the nails wonderfully, only taking a little while to dry completely. My skin is becoming quite dry now that the weather is changing, I feel like I've been losing that bit of life from my skin. Without this product, my skin would look so dull and drying. MUA Highlighter has helped my skin look a bit more healthier during these cold months and it has given my face life and a natural glow which looks amazing in any type of lighting. I like using this highlighter on the top of my cheekbones, the tip of my nose, the highest point of my forehead and also the highest point of my chin. I'm not too sure whether this brush comes separately or if it just comes with part of the core collection but I'm pretty sure you'll be able to find this on eBay if you're looking to purchase this brush just on it's own. I never used to contour at all mainly because I didn't know how to contour properly. As my love for make up has grown over the past years and I have watched several videos on how to contour, it has now become a daily thing which I have included in my make up routine. This brush is the perfect shape as it fits right underneath your cheekbones to give you that really defined looked. I would recommend blending it out a bit with a buffing brush afterwards though so it's not as harsh. Although the price is quite high for a lip care product, it's so worth it. This is used for if you want to plump your lips up a bit more, however it's also an amazing product for when you have chapped/dry lips. As it's the colder months my lips are becoming more dry than usual, but since using this on my lips everyday I have noticed such a difference in how they feel and look. The product includes a lavender extract which strengthens the cutaneous barrier thus smoothing the lips. It also has a Vitamin E extract with anti-oxdising properties to protect against free radicals. You can use this as many times as you want on your lips and it won't irritate them in the slightest. I am forever on pinterest looking for new bedroom ideas or home ideas. 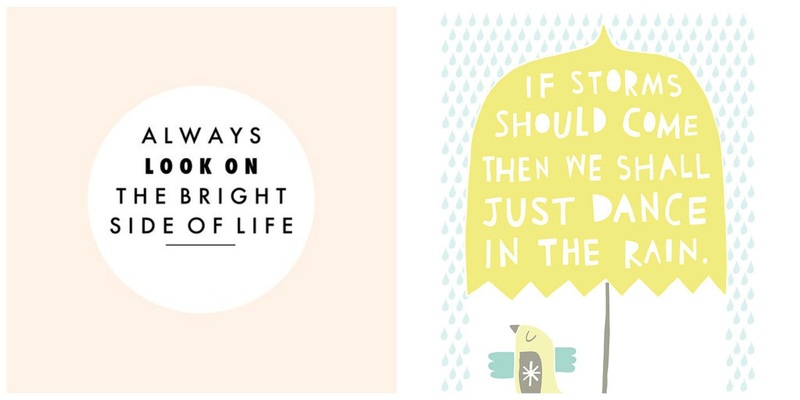 I have a whole board of pictures dedicated to home ware decor. When it comes to decorating and looking for new pieces around my bedroom or the house I usually gravitate towards H&M, Next, TK Maxx, IKEA and ZARA. 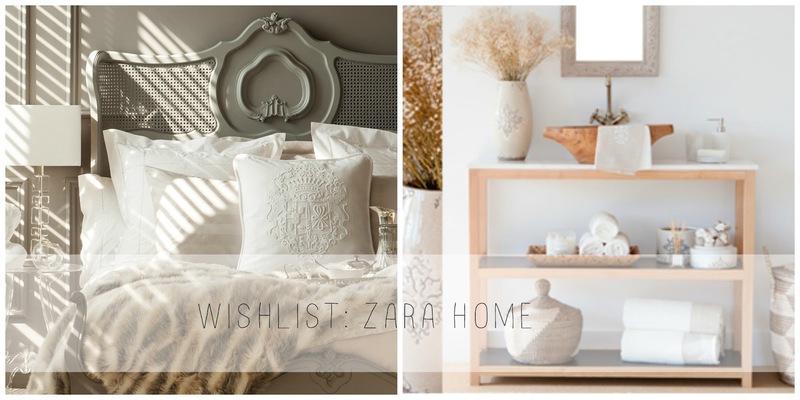 I have recently been spending a lot of time on the ZARA home website and I have found so many items which I have been craving for. I am in love with the gold colour of this cushion. I'm trying to change up my bedroom decor to make it fit the autumn season, and I think this fits in perfectly. The detailing of the leaves and the contrast of the gold and white is beautiful. This item is actually a soap dish but I like the idea of keeping all of my rings inside there. I think it looks quite quirky and it would go really nicely on top of my chest of drawers. I would use this glass and metal jar as a piece of storage for my cotton buds. I literally have no where to put all of my cotton buds at the moment, so I just keep them in their original packaging. However, it looks way to boring and dull for my liking and I would really enjoy something like this to store them all in. At first I thought about using these wicker baskets to store any of my hair care products inside, but then I thought it would be a cute idea to keep them in the living room and store a few random magazines inside. Therefore whenever there's company, they can happily help themselves. I am in love with antique looking items and when I saw this on ZARA, it had to be included. I would use this to store my jewelry inside or you could even use this to store some arts and crafts supplies such as buttons and feathers. I'm always burning a candle in my bedroom. I really do think they light the mood and make the room look much more cosy. This feather detailed candle holder is perfect for Autumn due to the dark rusty colours of the detailing. 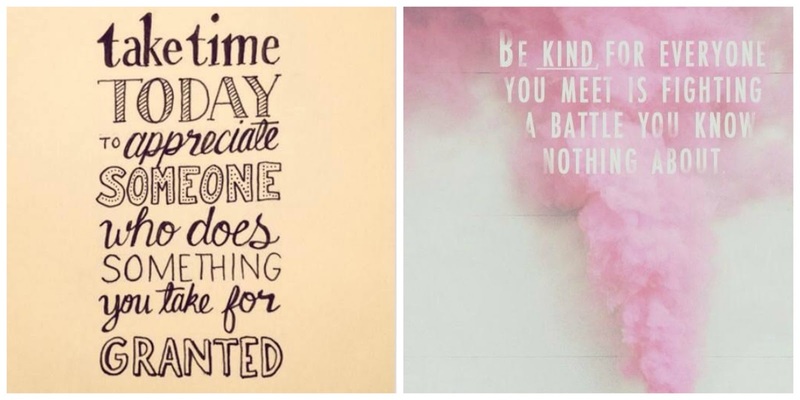 One thing I wish I did this year was keep a journal/diary. 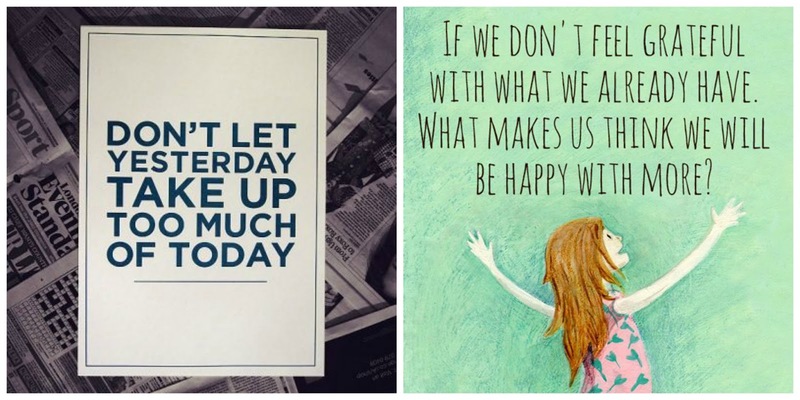 I like the idea of writing down what happened in my day so I can always go back to read and re-live that memory all over again. 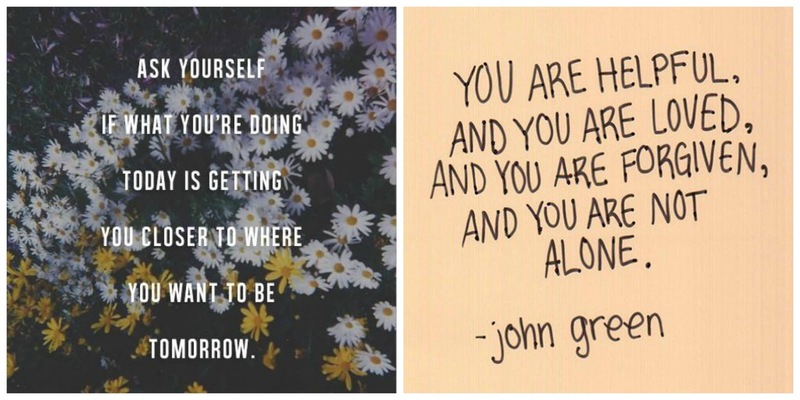 I have decided in 2015 I am going to try and write a journal entry at least once a day. I love the pattern of this journal and the inside of it is so simple yet you could write so much. I think this is really cool, quirky version of a bedside table. If you're looking to change your bedroom to fit in with the Autumn season then I would recommend this cute table, as the branch detailing represents the Autumn months. This would look lovely with some orange coloured artificial flowers sitting on top. When I'm having a lazy day, I always wrap myself up in a blanket. Now that the weather is getting colder I find myself using blankets more than anything. Check print is really popular in the Autumn/Winter months, and the brown colours give it a sense of warmth to your home. This would look lovely laid over the sofa or even over the bed like a throw. I know it has been a while since the launch of Baby Skin, but believe it or not I have never tried this pore eraser before. 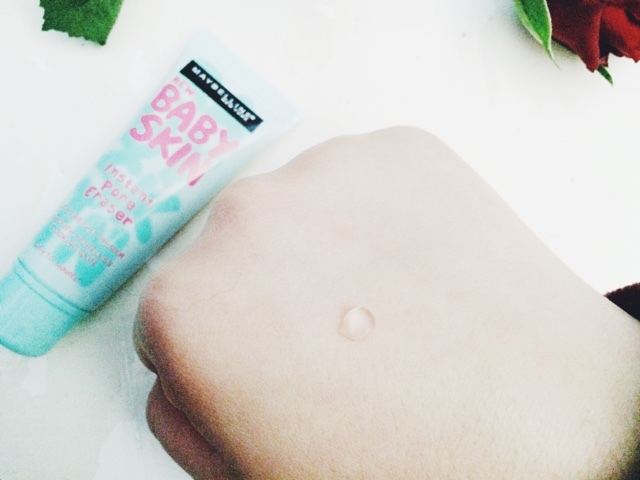 I went mad for Maybelline Baby Lip Balms and I still use some to this day, therefore I was very intrigued to see what Baby Skin had to offer. I do love a good primer and I always use one before I put my make up on, mainly because I want a smooth looking face which is easy to work with when applying foundation and also because I want my make up to last throughout the whole day. This primer is not like any other primer I have tried before due to it's silicone gel consistency. When applying this to my face it feels slippery but not greasy. This primer is supposed to smooth out your skin which it does a fabulous job of, and it's used to get rid of any large pores which again, it works perfectly! 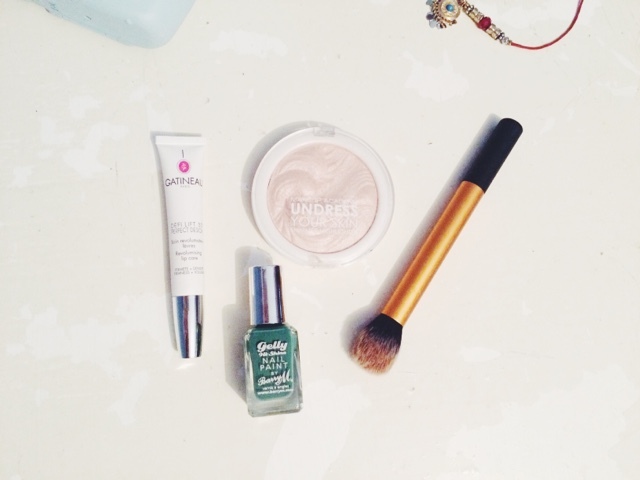 You can use this either under or over makeup, however I prefer to use under makeup. I love how this product is completely fragrance free which is perfect for those who have sensitive skin (myself included). I feel as if this product does exactly what it says it does. I wouldn't recommend this product for those who have oily skin, as it will only make your skin feel even more oilier due to the silicone texture of this product. On the other hand, if you have normal or dry skin, I'd defiantly recommend you give this a go and see what you think of it. It makes my face look flawless after I apply foundation, and it's now included in my everyday makeup routine. Foundation is a daily essential for me. I use it for whenever I'm going out for the day. Sometimes I have very long days at work therefore I'm always looking out for that foundation which will last throughout the whole day without having to touch up. 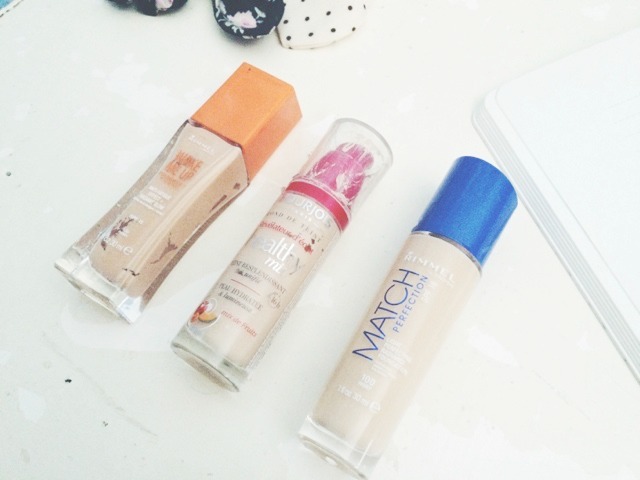 I have rounded up my top 3 drugstore foundations as these are the ones that I use the most on a day to day basis. Rimmel Wake Me Up Foundation believe it or not was my first ever liquid foundation that I tried. All I ever used for foundation was the Maybelline Dream Matte Mousse and I was using that for a good 3 or 4 years. Around 2 years ago, I started getting a lot more involved in make up and different types of it plus my matte mousse foundation was making my skin extremely dry and flaky which isn't a good look. I then decided to invest in a liquid foundation, Rimmel's Wake Me Up foundation was the one I picked out and I have been using it ever since. It's a very light to medium coverage foundation but you can easily build it up to what ever you prefer. 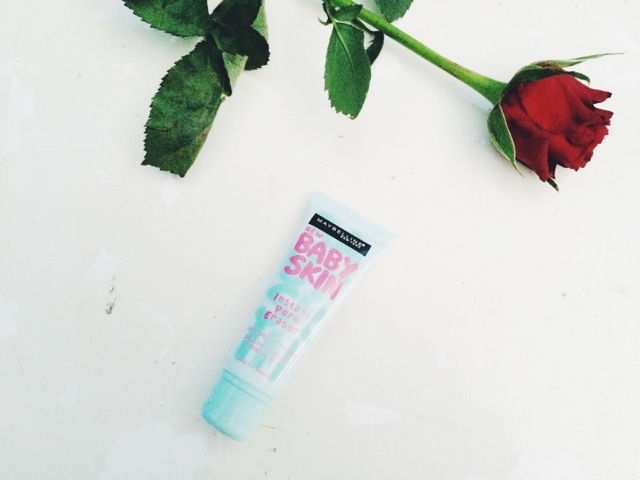 It glides on the face so smoothly and it also smells amazing! It has a anti-fatigue effect which helps make you look more awake and it also includes a radiant glow so it makes your skin look healthy. I love this foundation for every day wear and I have found that it lasts a good 8 hours before you need to touch it up again. 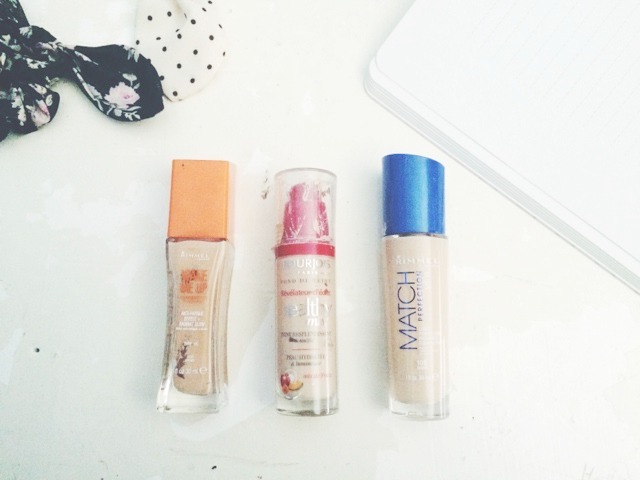 Bourjois Healthy Mix Foundation is the most expensive foundation out of these three. Retailing in stores for £9.99. This is an interesting foundation as it is enriched with a fruit therapy formula to enhance your complexion - this includes Apricot for radiance, Melon for hydration and Apple to protect your youth. I find that this product evens out my complexion really well and it leaves my skin with a beautiful flawless finish. I tend to get quite dry skin during the winter, but I have noticed that this foundation doesn't cling to any dry patches on my face, it does the complete opposite by leaving my face very hydrated throughout the day. Rimmel Match Perfection Foundation I find this foundation quite similar to the Wake Me Up foundation but without the anti-fatigue effect. It smells the same and it glides onto the skin smoothly, it also leaves the same finish as the Wake Me Up foundation. This foundation includes Light Perfecting Radiance which is basically supposed to make your skin look amazing no matter what light you are in. It has a Sapphire Radiance which gives your skin a beautiful glow. The formula of this foundation is very liquidy so it's a light coverage but it can be build-able to your preference. The other day I went to a family event wearing this foundation and I was complimented on it and someone said to me that it has stayed on really well. I got home and noticed that my foundation has in fact stayed on throughout the entire day/night, I was so impressed. Some days I love my hair, other days I dislike my hair. My hair is quite fine and very damaged due to heat and hair dye therefore I sometimes find it quite hard to style. I have tried tons of different hair products to help repair and restore my hair, but I have never stuck to certain hair products until now. 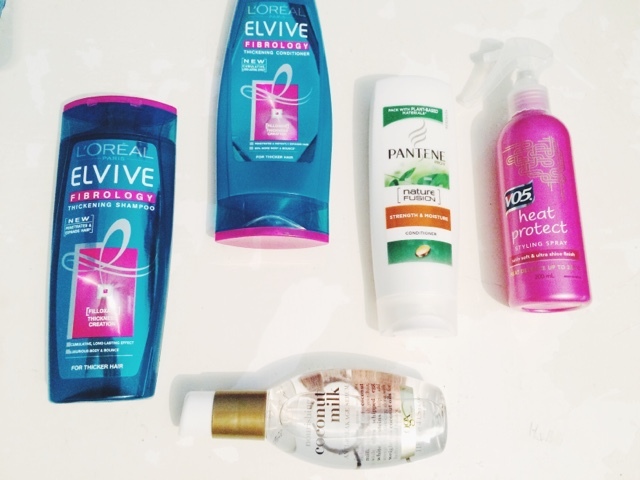 I know that I will most probably be changing up my hair care products again in the future, but until then here's some of my current hair care essentials which I have been loving over the past month. When it comes down to washing my hair, I have been using the fairly new LOreal Elvive Fibrology Thickening Shampoo and Thickening Conditioner. Like I said, my hair is quite fine but these products do a great job in giving my hair that extra boost it needs. These products include an ingredient called Filloxane which claims to penetrate the fibers and help expand and increase the diameter of each hair strand. I can defiantly tell my hair looks and feels a lot thicker after using the shampoo and conditioner, it also gives my hair a bit more texture to it which helps me to style it easier. I have noticed that sometimes my hair becomes quite dry when using the thickening shampoo and conditioner, therefore every once a week I skip out on the thickening conditioner and swap it with Pantene Pro-V Strength and Moisture Conditioner. I apply this to my hair after washing with shampoo and I then leave it in for about 5 minutes before rinsing it out. This product helps to keep my hairs moisture and gives it a deep conditioning every week. Like most girls, I like to straighten my hair. I have naturally curly hair which sometimes begins to look a little crazy after a few days so I like to straighten it to make it look less crazy and more manageable. My most favourite heat protect spray would have to be the VO5 Heat Protect Styling Spray, which protects my hair up to 230 degrees. This product also helps calm frizz which is perfect for me as I have major frizzy hair. I have noticed that it leaves a beautiful shine to my hair which makes it look a lot more healthy. I don't use a hair dryer on my hair. I prefer leaving my hair to dry naturally as it's much healthier for your hair. When I finish washing my hair, I towel dry it and whilst it's still a bit damp I then apply Organix Coconut Milk Anti-Breakage Serum, which works wonders. I add 2 pumps of this onto my palms and rub it into my fingers, then apply evenly throughout the mid-lengths and ends of my hair. This product contains a blend of coconut milk to help nourish my hair, whipped egg whites to help add strength and elasticity, and also coconut oils for added hydration and balance. 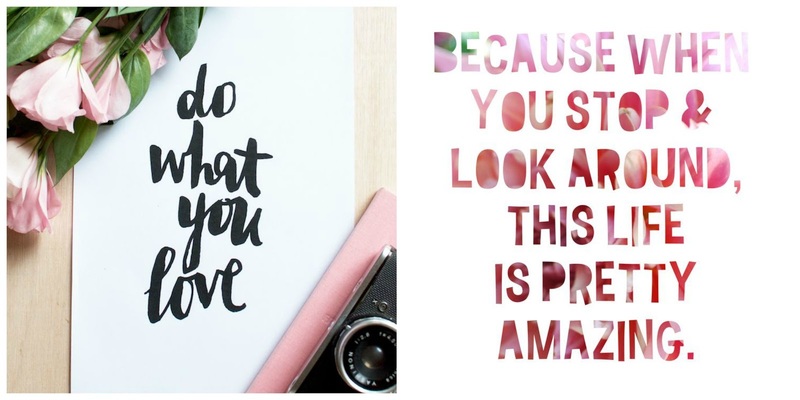 For today's post I thought I'd do something a little bit different, that I haven't done before on this blog yet I see it all the time on others and I absolutely love reading them. 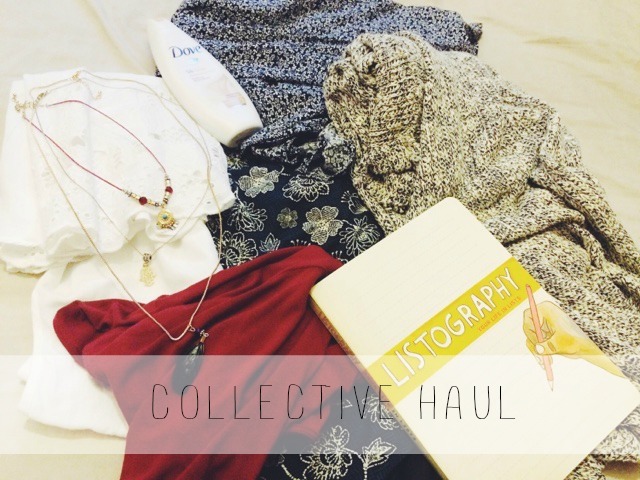 A Collective Haul! These are a few items which I have purchased over the last 2 months or so, and I thought I'd share them with you and hopefully it'll give you some ideas for when you next go shopping. Starting off with a few little pieces that I bought. One of my favourite items which I have been absolutely loving recently is my Listography book that I got from Waterstones. I have seen this book before and I didn't know whether to buy it or not, but I finally caved in and did it. It's honestly such an amazing book if you love writing down lists (just like I do). It really gives you something to do in your spare time or whenever you're bored. 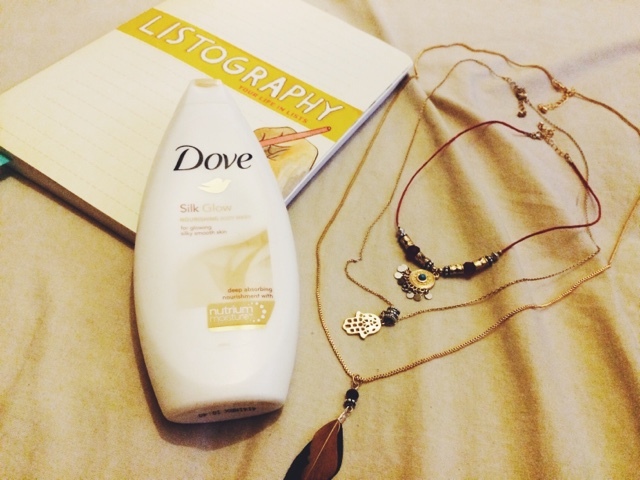 I bought a new Dove body wash which is amazing. It literally feels like you're rubbing silk all over your body, it's so satisfying haha. The other little piece I got was from Topshop and it's actually a necklace set, you get three beautiful necklaces for £14.50 and although that may sound a bit expensive, the necklaces last for ages and they're all such good quality. 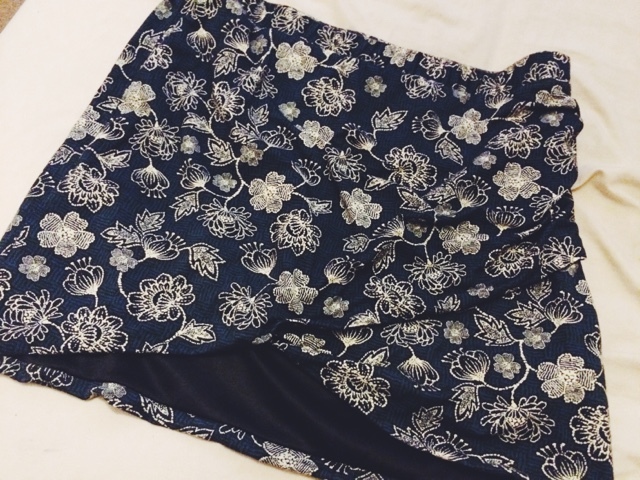 Moving onto the clothes and starting with Newlook, I bought this gorgeous navy wrap over skirt which has a beautiful floral print on it. 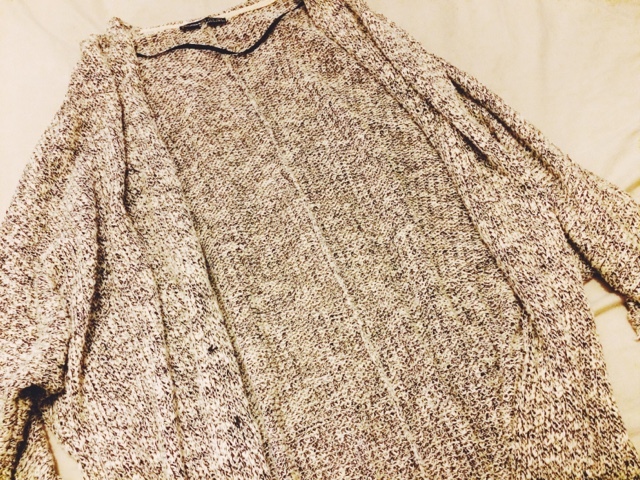 I actually bought this to specifically wear on a night out I was going to, but I love wearing this skirt paired with black tights and cute ankle boots for the fall season. 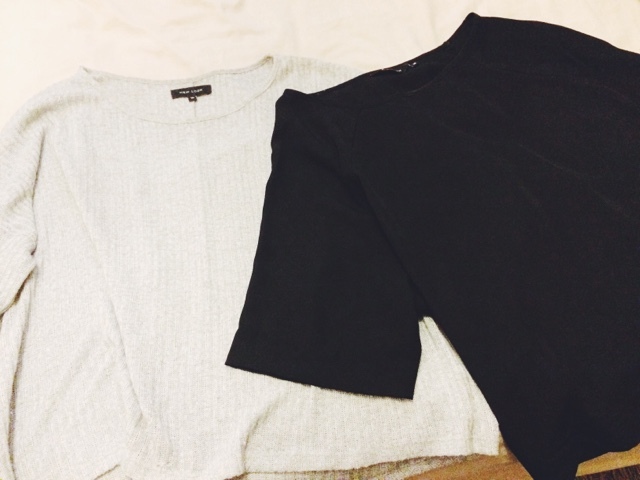 I then bought 2 plain tops because you can never have enough basics. These tops are just perfect for every day wear but you can also dress them up with a cute statement necklace and maybe some high waisted pants. 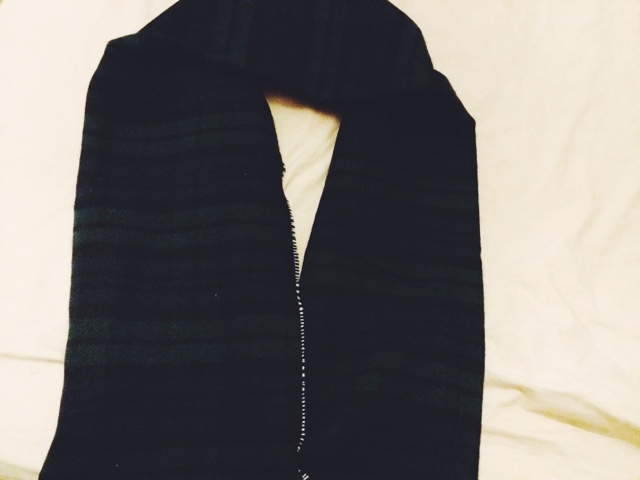 The last item I bought from Newlook is this beautiful tartan scarf, I am a massive fan of anything that's tartan print and I thought this was so pretty especially for Autumn/Winter. I bought two tops from Topshop. 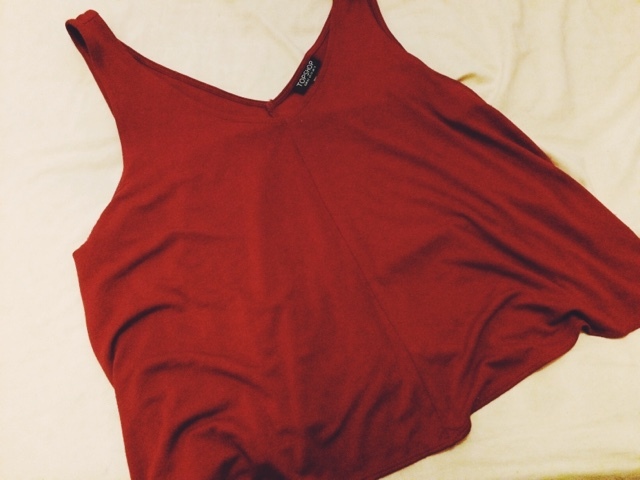 First top was a plain burgundy coloured crop top which they have in a variety of different colours and they're only £12. Something tells me that I may have to take another trip to Topshop again to get some of these tops in more colours. 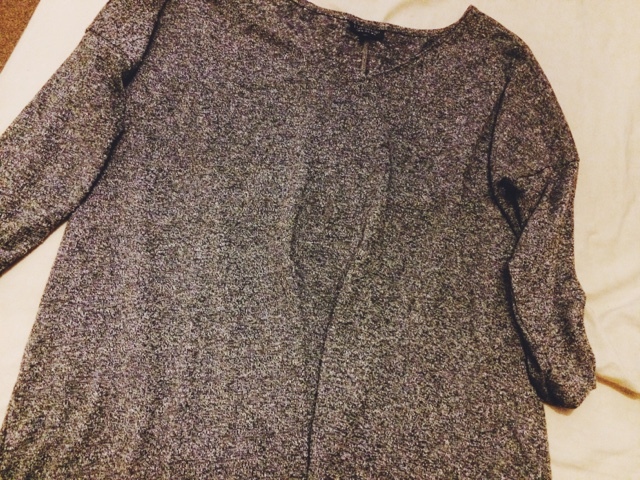 The second top was actually something I found hiding at the back of a rack of clothes, the only down fall to this top is the fact that it isn't my size so it looks a tad too big on me, but I wanted it so much that I just didn't care at the time. 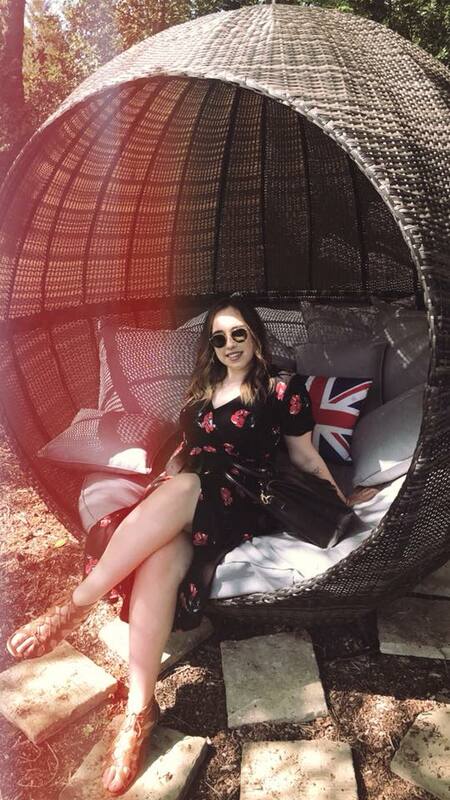 It just looks like a over sized top which is fine because I love baggy over sized clothes as they're much more comfortable to wear. 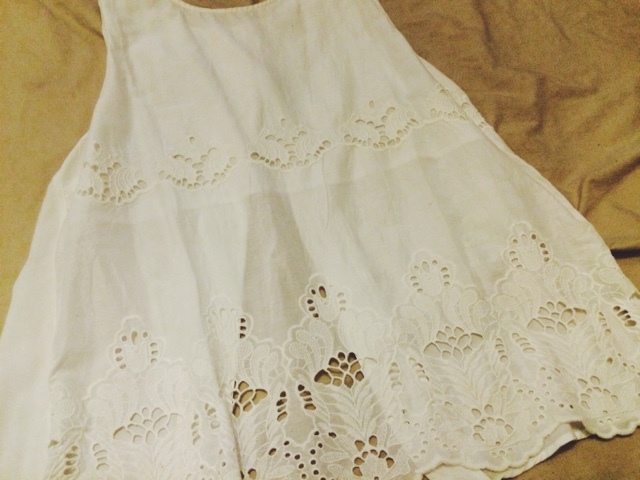 The only item I bought from River Island was this beautiful white lace top. I fell in love with the detail on this top as soon as I saw it and I just knew that it had to be mine. I have been wearing this top to death and it now has foundation marks on the neckline, oops. The back of this top is buttoned so you could either have it closed or open back if you want. 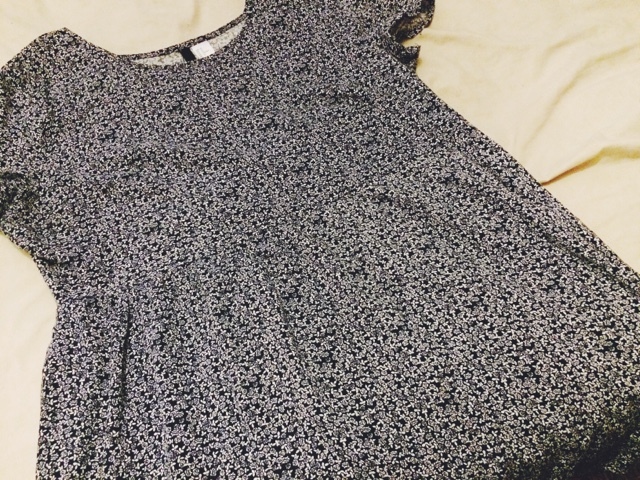 This is another item which I have been wearing to death and it's this beautiful floral print dress from H&M. I love wearing this with black tights and ankle boots for an every day look, but you could dress this up with a pair of heels and it would look amazing. It's also so comfortable to wear. Of course I had to take a trip into Primark. Firstly I bought this cream/grey (ish) cardigan which is perfect for slouching around the house in. This cardigan also goes really well with skater dresses. 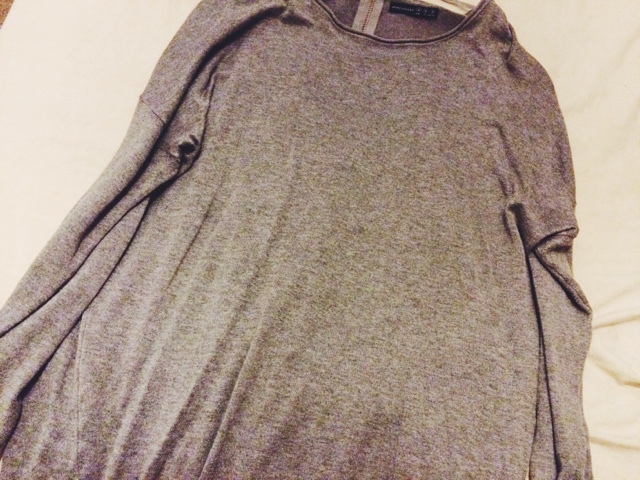 I then bought this over sized grey jumper which has a zip all the way down the back for a bit of detailing, again this is also perfect for slouching around the house in or if you want to wear something a bit more casual and comfortable for the day. 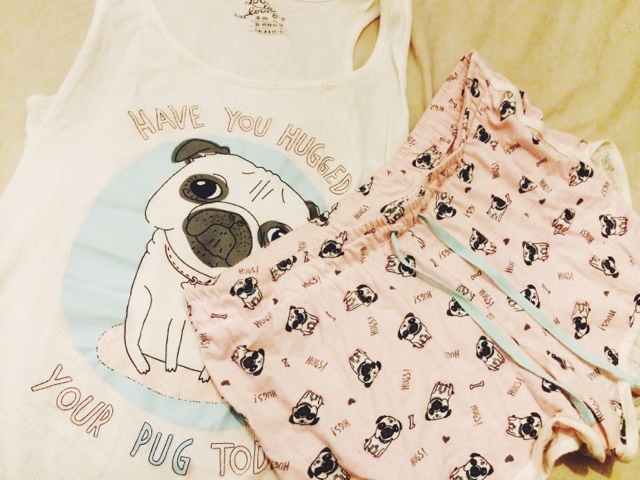 Last but definitely not least, I found these super cute pug pyjamas! I absolutely love pugs, I would own 10 little pugs if I could. Of course I had to buy these, they're so comfortable and they make me happy every time I wear them haha.